In the wake of the North American tour’s stellar reviews and added concerts, Katy Perry announces the Asia leg of WITNESS: The Tour. 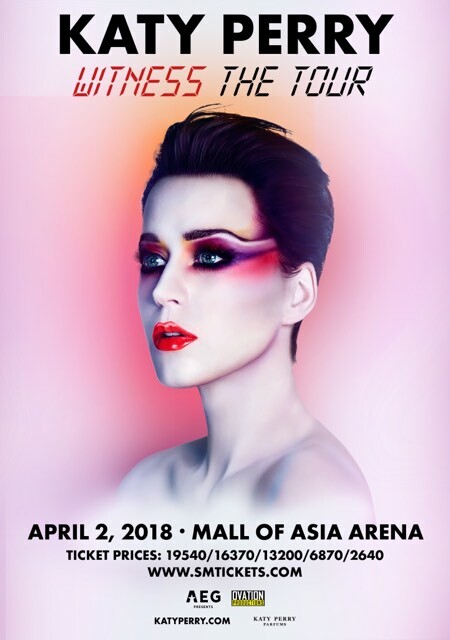 Produced by AEG Presents and Ovation Productions, Katy Perry will visit Manila on 02 April 2018 at the Mall Of Asia Arena. Besides Manila, WITNESS: The Tour Asia leg also includes Tokyo, Hong Kong, Taipei, Singapore, Bangkok and Jakarta. This announcement follows the addition of a South American leg in March, Mexico, UK and European legs kicking off in May of 2018, and an Australian/New Zealand leg commencing in July of 2018. Tickets for the 02 April 2018 show go on sale 12 noon of 11 December 2017 via KatyPerry.com. Ticket prices are P19,540/ 16,370/ 13,200/ 6,870/ 2,640. See itinerary via www.smtickets.com. 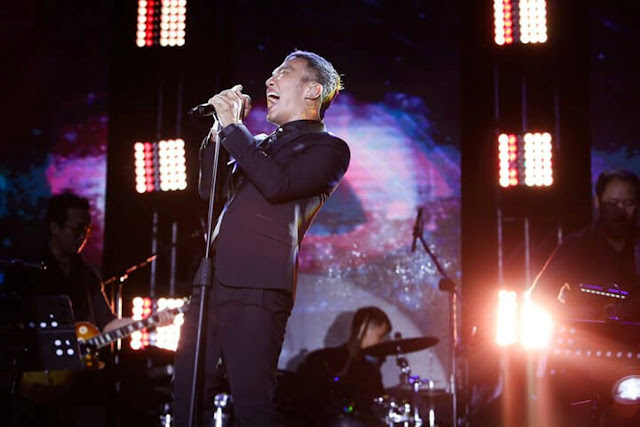 The North American leg, which began in September, has received rave reviews. With Witness, Katy finds liberation, in the changes in her own life and in the world around her, delivering songs that inspire both thought and movement. The singles released thus far – the Platinum-certified “Chained to the Rhythm” featuring Skip Marley, and the singles, “Bon Appétit” featuring Migos and “Swish Swish” featuring Nicki Minaj – hint at the breadth of the musical and thematic elements found on Witness. WITNESS: the Tour is an imaginative trip from outer-space to inner-space, from the planets to the bottom of our oceans, and a musical journey through Katy Perry’s biggest milestones and mega-hits right up to her latest album. The dramatically original staging means that there isn’t a bad seat in the house, when Katy brings out her band and dancers, along with all the bells and whistles. WITNESS: The Tour is Katy’s first run since the sold-out, 151-date Prismatic World Tour, which concluded in 2015 and was hailed by Rolling Stone as "a show to damage retinas and blow minds." Sponsors include KATY PERRY PARFUMS. Katy made her Capitol Records debut with 2008’s One of the Boys after signing to the label in 2007. She cemented her status as a global superstar with the follow-up album, Teenage Dream (2010). PRISM, her 2013 album, debuted at No. 1 on iTunes in 100 countries and has sold more than 12.5 million adjusted albums worldwide. With the singles “Roar,” “Firework” and “Dark Horse” each surpassing the 10 million threshold including song sales and streams, Katy is the first female artist to earn three RIAA Digital Single Diamond Awards. In her 10 years with Capitol, she has racked up a cumulative 18+ billion streams alongside worldwide sales of more than 40+ million adjusted albums and 125+ million tracks. She is the most-followed person globally on Twitter, and the first to surpass 100 million followers.